WELSH: For War News Radio at Swarthmore College, I’m Tyler Welsh. BAILIN: And I’m Nora Bailin. 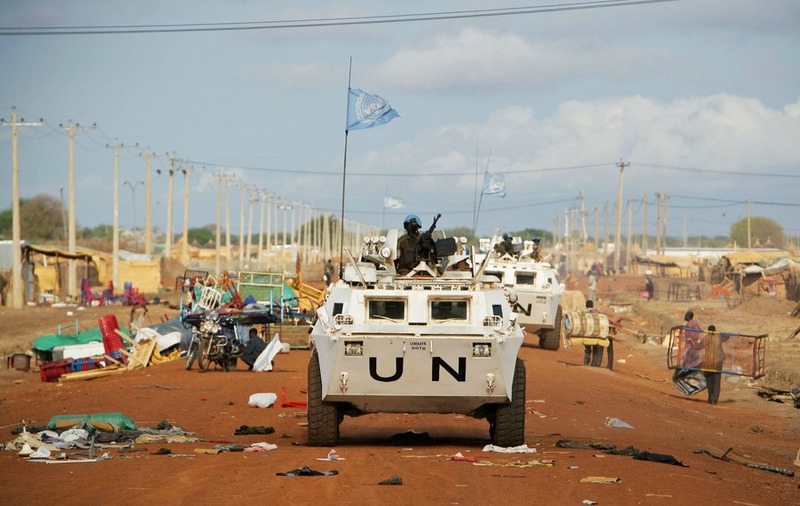 Peace talks in South Sudan were delayed this week following attacks by rebel forces on a United Nations base in the city of Bentiu. At least 100 civilians were killed and 400 others were injured in the massacre, according to a U.N. official. Although victims have not yet been identified, reports have indicated that those targeted were members of the ethnic Dinka group, which includes supporters of President Salva Kiir, rather than the Nuer group, which includes members of the rebel militia and supporters of former vice president Riek Machar. A spokesperson for the rebel faction, however, denied that the rebels were responsible for the attack and accused the U.N. of fabricating the story as, quote, “cheap propaganda.” Thousands of civilians have been displaced from their homes or killed since fighting began in December, but recent peace talks have done little to quell the violence across the country. WELSH: Over 200 Nigerian schoolgirls were kidnapped by anti-government extremists last week, and as of this Monday, at least 190 are still missing. The kidnappers were suspected of being members of Boko Haram, an insurgent group that opposes the education of women. Security forces in the region have said they are in, quote, “hot pursuit” of the girls’ captors, but have yet to recover any of those missing. Violence from Boko Haram is common in the region, but sources say that a kidnapping of this size is unprecedented. Although the Nigerian government and military have claimed that Boko Haram’s power is declining, deaths attributed to the group have reached record highs this year, with more than 1,500 having been killed this year. BAILIN: An Afghan police officer opened fire at Cure International Hospital in Kabul Thursday morning, killing three Americans and wounding several others. The assailant, who had worked at the hospital for two years, is now in the custody of the Afghan government after an unsuccessful suicide attempt following the shooting. The American-run Cure International Hospital, which opened in 2005, is part of an international network of hospitals run by a Christian charity organization based in Pennsylvania. According to Kabul’s police chief, Abdul Zahir, an investigation is underway to determine the cause of the attack. The shooting marks a recent increase in attacks by members of the Afghan security forces and Taliban militants, targeting foreign civilians. Jawid Kohestani, a former Afghan army general and Kabul-based security analyst, believes the Taliban and its supporters are increasing their attacks on civilians in an attempt to quote frighten foreigners and disrupt their reconstruction and development work. WELSH: Fatah and Hamas, previously opposed Palestinian factions, recently announced a reconciliation deal, ending a seven-year political rift. The political organizations violently split in 2007, resulting in Fatah governing the West Bank and Hamas controlling the Gaza Strip. The recent resolution called for the formation of a united government within the next five weeks followed by national elections after six months. Yet many ideological and political differences remain. The unity may also jeopardize international aid and diplomatic relations with Western countries, due to Hamas’ international classification as a terrorist organization. In response, Israel indefinitely suspended American-sponsored peace talks and Israeli Prime Minister Benjamin Netanyahu announced that Palestinian Authority President Mahmoud Abbas would have to choose between peace with Hamas and peace with Israel. Around the same time the deal was announced, Israel carried out an airstrike on northern Gaza, wounding twelve Palestinians. BAILIN: The U.S. offered extensive assistance to Yemeni forces during a multiday anti-terror operation. On Monday, CIA drones are suspected to have targeted Al Qaeda fighters, weapon storage locations, and training camps in southern Yemen. The drone strikes killed over 65 people. U.S. special operations forces flew Yemeni commandos to a remote, mountainous location in southern Yemen in Russian-built helicopters, seemingly to obscure U.S. involvement. The Yemeni commandos then engaged in a firefight against suspected members of Al Qaeda in the Arabian Peninsula. U.S. military personnel are conducting DNA tests to determine if master bomb maker Ibrahim al-Asiri was among those killed in the firefight. U.S. officials emphasize that the raid did not target the leadership of Al Qaeda in the Arabian Peninsula, but they have not yet confirmed if al-Asiri was killed. WELSH: Russian military forces engaged in drills along the Ukrainian border this week, as tensions continue to rise over pro-Russian protesters in eastern Ukraine. Russian Defense Minister Sergei Shoigu announced that these drills would include military flights along the Ukrainian border. Russian President Vladimir Putin warned that any action taken by Kiev against these demonstrators would be, quote, “a serious crime against their own nation.” The Russian Foreign Ministry, meanwhile, has claimed that the United States and Ukraine are distorting the terms of the recent agreement signed in Geneva and are failing to reign in nationalist forces in Ukraine. US officials say President Barack Obama will impose new sanctions on Russian officials close to Putin, and 150 US troops have already been sent to Poland in order to reassure allies near the Russian border. BAILIN: At a press conference with Japanese President, Shinzo Abe, President Obama expressed American military support for Japan in the event of an escalation of the China-Japan territorial dispute of the Diaoyu, or Senkaku Islands. In this first leg of his weeklong tour of Japan, South Korea, Malaysia, and the Philippines, the President referred to the obligation of the United States to offer military support for Japan if it were to come under attack, citing the 1960 security pact between the United States and Japan. Nearly two decades since the last United States President visited Japan on a state trip, President Obama’s arrival serves as a reminder to the Japanese that the United States remains a faithful ally. Japan, South Korea, Malaysia, and the Philippines are increasingly important partners with the United States to counterbalance China’s growing influence in the Pacific region. WELSH: Suspicions of activity at the North Korean underground nuclear site, Punggye-ri, suggest that North Korea may be preparing for another nuclear test. Both the South Korean Defense Ministry, and a state-run Chinese news agency claim to have observed these activities. Senior fellow at the Institute for Peace and Cooperation in Seoul, Lee Byong-chul, says that “North Korea wants attention ahead of Obama’s visit,” referring to President Obama’s weeklong Asia tour. South Korea insists that the North might soon detonate a nuclear device, in spite of the Obama administration’s call for North Korea to curtail its nuclear program. China maintains diplomatic relations with North Korea, and South Korean President Park Geun Hye has pressured Chinese President Xi Jinping to discourage North Korea from carrying out additional nuclear tests. BAILIN: If you want to hear more from War News Radio, visit us online at War News Radio.o-r-g. This week’s newscast was written and edited by Jay Clayton, Joelle Hageboutros, Allison Hrabar, Sabrina Merold, Dylan Okabe-Jawdat, Jerry Qin, Nithya Swaminathan, Chloe Wittenberg, and Henry Zhang. I’m Nora Bailin. WELSH: And I’m Tyler Welsh. Until next time, thanks for listening.